To meet business owners' need to combat inventory shrinkage, Sigmax introduces POS-EM (Point of Sale-Event Monitor) solution to interface with more than 800 POS and cash register models and combine transactional data from POS with video images to enhance monitoring of business activities. The solution is ideal for retail business of any scale and can be expanded to cover ATMs, slot machines, electronic measurement devices which have been widely used in banking, gaming, medical sector and so on. The solution also maximizes HDER's networking capability and enables remote monitoring of multiple business sites to improve response time when incidents occur at more than one location. The data streaming from each terminal of an NCR ScanMaster multiple Point Of Sale Supermarket installation was deemed unsuitable for integration with the Sigmax HDER due to the superfluous information above and beyond the transaction text. That data included advertising information for the customer check-out display. The end users wanted video surveillance recording of each POS terminal with transaction data only on those recordings. Integrate the HDER directly with the NCR ScanMaster Server over the LAN using the latest version of the Sigmax POS-HDER software enabled to identify each terminal, assign it with a camera input, strip the superfluous data, overlay the transaction data on screen while still supporting the event database utility of the program. This configuration in this case reduced the scope of work compared to the standard system design of connecting each terminal separately to the HDER. A large supermarket in Houston was considering upgrading existing security system to expand coverage of monitoring to include its busy check-out area. The management wanted more control over employee theft, especially those illegal activities happening under the check-out scanners. However, their budget for increasing physical security equipments limited them to an integrated solution, instead of introducing more standalone systems. Sigmax proposed to the client a retail solution that upgraded their existing HDER system to be equipped with as many channels as the management needed to cover check-out area, and a POS-EM component as an add-on to make further use of transactional data. The client can locally or remotely via Internet, track real-time exception events from each POS terminal. 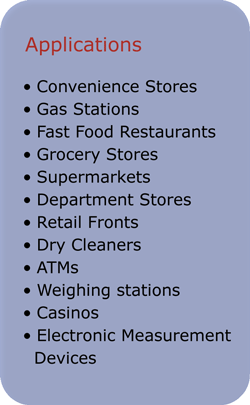 The POS-EM subsystem alerts the supermarket manager once an exception condition (such as NO SALE, VOID, etc.) occurs and enables instant review of the abnormal event. The multiple choices of exporting video and audio offer a better way to provide the client and even the police with immediate evidence of an incident. The retail solution solidly meets the client's need for more security in their daily operation. A large scrap metal dealer in Houston was looking for a way to improve its loss prevention capabilities with a networked HDER system that could integrate, rather than overlay, weight scale transaction data. They also wanted the ability to access the integrated video and event data remotely over a wide area network. Haws Burglar Alarm Co, a Sigmax Security dealer, provides the solution to the client's loss prevention division. Sigmax HDER and Central Management System (CMS) enable the client to view and access recorded video synchronized with weight scale transaction data by location, transaction number, or date/time. It has reduced the time needed to investigate and assemble relevant incidents per exception by remarkable amounts.